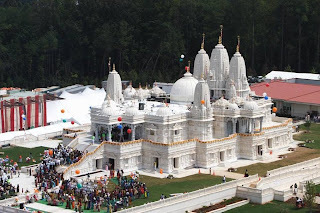 It is one among the top ten largest traditional Hindu Vedic stone temples outside India. 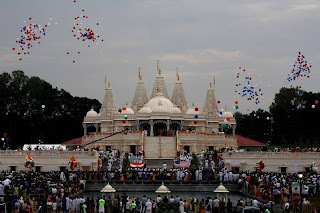 The largest temple of the BAPS Swaminarayan sect in United States. The temple is located on 30 acres of land. The exterior of the Mandir is made of Turkish Limra limestone. The main floor is made of Italian Carrara marble. The ground floor and basement is made of Indian Sandstone. Smallest stone 15 gm to largest stone of 5.2 tones. Total stone material is 8430 tones. 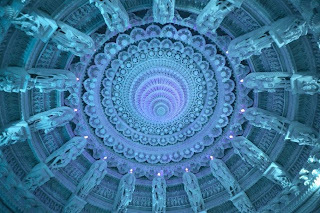 The width of main dome is 23' 3"
The Mandir has tapered ceiling. Inside and outside 'parikarama' for devotees to circumambulate around deities. Number of Shikhars is 5. Number of small domes is 6 and one large dome. Number of Torans (arches) is 129. Number of Sinhasans (throne) is 9. Number of windows is 14. Number of Pillars is 151. Apart from this the Mandir has numerous windows and pillars, which are intricately carved, and also marble steps. Under floor heating with Gel tubing. 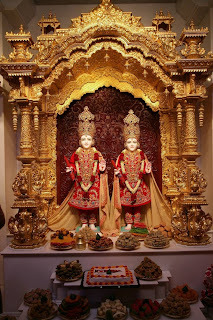 Estimated cost of the Swaminarayan temple is $19 million. The pillars of the temple are intricately hand-carved and each pillar depicts a famous incident from Hindu scriptures. 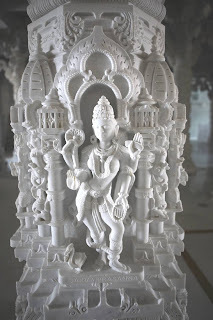 The construction of the Mandir is based on 'Shila Shastras' – ancient Hindu text dealing in building and sculpture techniques. Some stones like marble and limestone were imported from the respective countries to India. The stones were hand-carved in India and later imported to United States. Intricate geometric patterns, rosettes, feathers, leaves and other designs which number to more than 500 were hand-carved in India. Each section of the temple weighing from 50 grams to five tons after carving in India had a bar code.